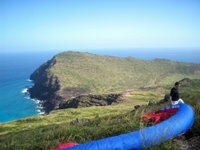 New Launch Discovered at Makapuu! A new launch discovered at Makapuu! And it's the king of launches! The top of the top! No really, we hiked to the top, past Cactus, past the middle launch, all the way up. Actually, I should admit that it wasn't really discovered today -- Jon showed it to me. Okay, okay, so it's not new either -- it's the launch they used in the old days when there was not enough wind at Cactus or the middle launch. Kind of like today! Man was it light down there. We launched and scratched at ridge height for quite a while before the lift just died off completely and we sank out to the LZ.